Last winter was so cold and windy that many of our plants suffered damage. Evergreens were the most effected by the cold temperatures, but perennial shrubs and flowers had their fair share of damage as well. Hydrangea buds were killed, rose stems dried out, and bulbs were frozen dead. In this article, we will focus on evergreens, but you may want to consider protecting all of your plants, especially those that are younger or more exposed to the cold and wind than others. Even though evergreens keep their colors during the winter, their root system is frozen over and pretty much out of commission. As a result, the roots are not able to replenish the plant leaves with water when they dry out, turn brown, and die. By taking these preventative measures against this moisture loss, you will be sure that your evergreens will survive the winter with little or no damage! Wrapping or covering plants in burlap – The objective here is two fold. First, by loosely wrapping evergreen trees or shrubs with burlap, you still allow sunlight and moisture in, but you break the wind and keep the plant warmer. The burlap acts like a windbreak for the plant! The second benefit is that heavy snow and ice will not sit on the branches causing them to sag and possibly snap. This will guarantee they hold their shape through the winter. The best time to wrap evergreens is around the time the ground is beginning to freeze; November or early December typically works well for Western PA. Creating wind barriers – Much like wrapping plants in burlap, creating a wind barrier or wall can be a simple and effective solution to moisture loss during the winter. We typically suggest using burlap, but landscape fabric (weed barrier) can be used as well. To create this barrier, you will want to place stakes at the corners of the area you want to protect and then mount the burlap or landscape fabric to those stakes. You don’t have to pinch the fabric right up against the plants, but it should probably be no further than about 2-3 feet from the evergreens. If the walls are quite long, you will want to place extra stakes in the middle to offer support. This option is also great to prevent the “splash” of road salt from contacting your flower beds and evergreens, so you might want to consider installing this temporarily barrier up close to the street or along hedges. Installing these types of barrier walls is best performed in November or early December. Anti-desiccant plant sprays – Anti-desiccant (or anti-transpirant) sprays provide a protective coating to evergreen leaves to prevent the loss of moisture. They are clear transparent and are safe to use on most any evergreen. We stock Bonide’s Wilt Stop which is recommended to be applied on a warm day in late fall (temperatures in the 50s) so that the leaves are protected before the chance of a long extended freeze. One application is typically enough for our climate, but a second application may be made during the winter if the temperatures are warm enough for applying. This protective coating slowly breaks down over the winter and is nonexistent come spring. It also works well on houseplants that dry out quickly because of being close to an air vent or because of our naturally dry air during the winter! Perfect for rhododendron, holly, pine, boxwood, spruce, etc. If spraying on arborvitae, cypress, juniper or cedar, it is best to test a small area and wait for the plant to sufficiently harden off before application. 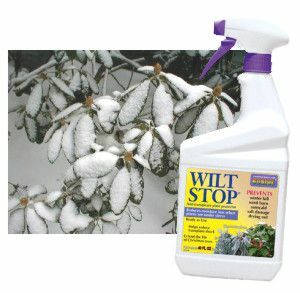 Wilt Stop will even protect foliage from road salt used to melt snow and ice, so spray those evergreens close to the road as well! For more information on anti-desiccant sprays, please reference this informative article. Consider following some of these steps this fall to put an end to winter burn and prevent the unsightly dieback that we experienced on so many evergreens last winter. If you have any questions about what is best for your plants, we are always here for you… stop by or give us a call today!